I think everyone who lives in NEPA has heard the famous "Ya go to Januzziiiiiiii's" radio commercial at one point or another over the years. I remember hearing the catchy jingle as a child and wanting to go grab a Januzzi's pizza every time I heard it. 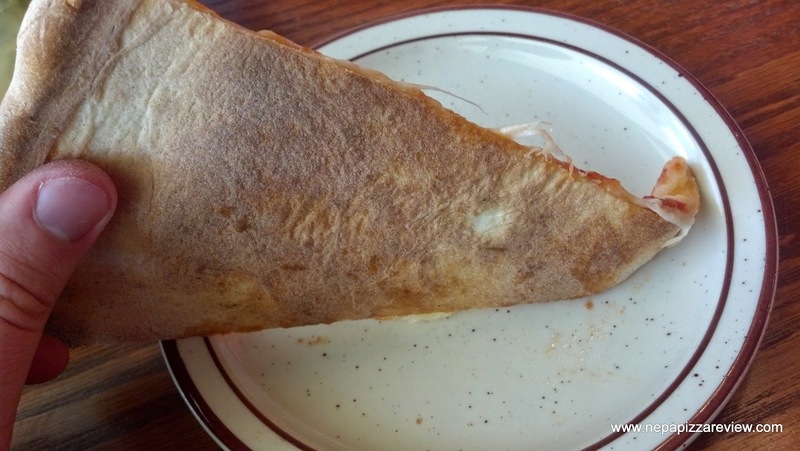 Januzzi's used to have a location in Clarks Summit many years ago, and that is where I first tried the pizza. Since that was at least 15 years ago, I can't honestly say I remember much about the pie, so as you could imagine, I was quite excited to try something that was both brand new and nostalgic to me at the same time! 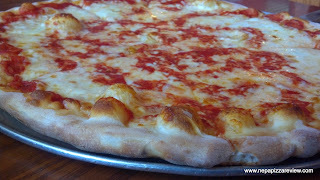 With that in mind, I grabbed the first lady and we fled to Wilkes-Barre to give it a try! First of all, I have to say I was quite impressed by Januzzi's storefront and the entire revitalized block of Northampton Street that the pizzeria resides on. 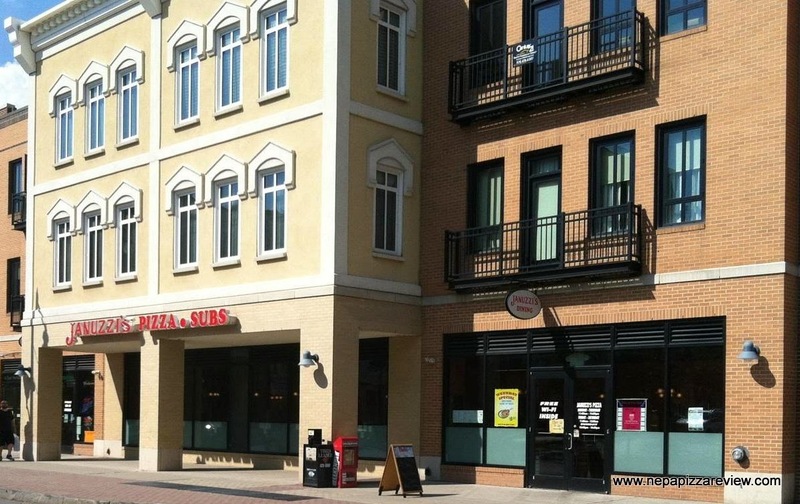 The place is adjacent to the movie theater, so it's a great location. Januzzi's even capitalizes on their location by offering a great pizza and movie ticket package for an unbelievable price (I think it was like 2 movie tickets, a pizza, and drinks for around $30 if I remember correctly). Needless to say, this place is the perfect setting to make a quick stop for dinner before or after a movie. I'd also imagine this is a perfect lunch spot and I'll tell you why - FAST SERVICE! The first lady and I placed our order for a pizza and wings, and everything was at our table within 8 MINUTES of ordering it! That had to be some kind of record, but this kind of speedy service would really suit a lunch crowd well, so kudos to Januzzi's for great service. After the piping hot pizza was placed in front of us, I took my customary photos of the pizza and it was time to try it out. The first lady and I each grabbed a slice and took our first bites. My new favorite thing to do is watch her face while she is taking her bite and see her reaction. I can immediately tell what she thinks of the pie, and in this case, I knew she really enjoyed it. 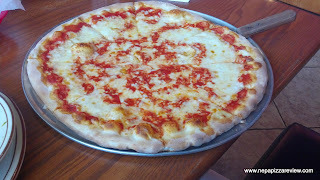 I have to say, that although this type of pizza (swirly-sweet-sauce) is not typically my favorite, I enjoyed it as well. 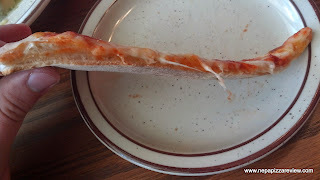 The crust was thin, light, cooked perfectly around the edges and bottom, but slightly doughy in the middle. Another two minutes in the oven probably would have put this pie over the top, but it really didn't take away from the experience as it wasn't severely undercooked, and most people probably like it cooked that way anyway. We noted that the sauce was really sweet, although it wasn't overly sweet because the salty cheese struck a wonderful balance between the flavors. The sauce had a smooth consistency and did not leave that sweet aftertaste like some sweet sauces do. The cheese (which I'm guessing is cheddar) was generously applied and had a creamy consistency and a buttery flavor which was very satisfying. The ingredients individually did not "wow" me, but together they worked in perfect harmony, so I was really impressed with the flavor balance. 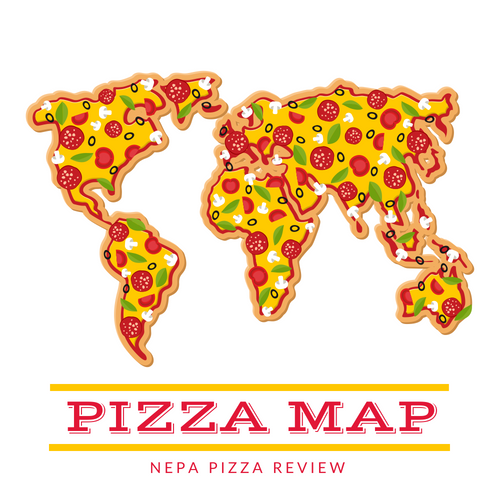 Overall, I thought this pizza was good, but the service was second to none. I couldn't believe how quickly the food came out, and how friendly the staff was. 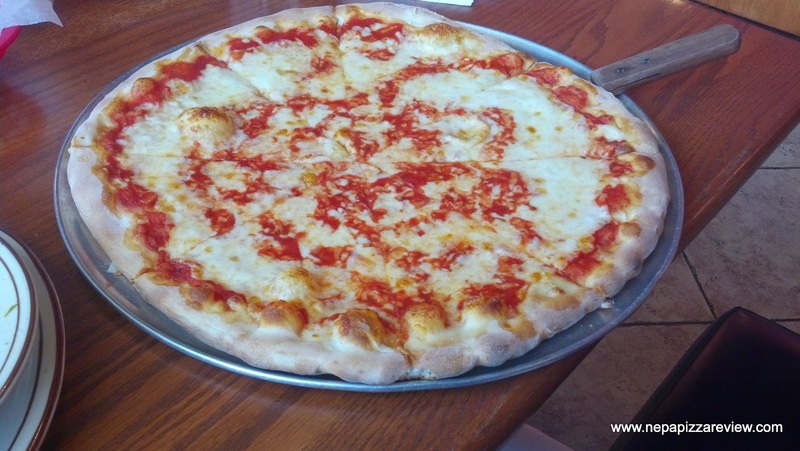 I'm not sure if I would say that Januzzi's is "the greatest tasting pizza in the land" because there is so much competition, but I would recommend that you try this very tasty pizza and let me know what you think in the comment section below!